Voice of the Employee gathers the needs, wishes, hopes, and preferences of all employees within an organization. The VoE takes into account both explicit needs, such as salaries, career, health, and retirement, as well as tacit needs such as job satisfaction and the respect of co-workers and supervisors. This post follows the line of Voice of the Customer in Excel: creating a dashboard. We are creating another dashboard, this time for the Voice of the Employee. Text-based data sources are a key factor for any organization that wants to understand the “whys”. Excel spreadsheets are still one of the most extended ways of working with big collections of data, especially among non-technical users. 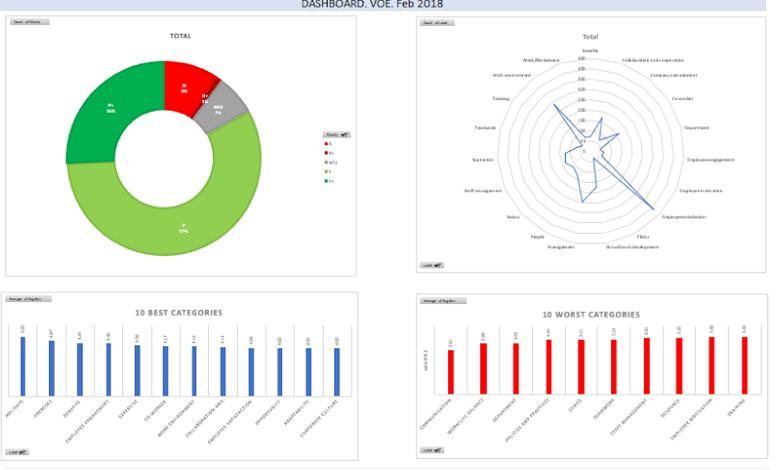 Two of our Vertical Packs, Voice of the Customer and Voice of the Employee, are particularly useful for typically non-technical teams, which can now carry out their analyses easily with our last Excel integration. In this tutorial, we are going to show you how to use the add-in provided in the Voice of the Customer Vertical Pack, how to carry out a VoC analysis, and how to work with its output by creating a dashboard like the one on the right. Working with the Voice of the Employee Pack would follow a similar pattern. Let us imagine we work for a market research department or agency interested in analyzing the Insurance industry. Customer comments in forums and social networks constitute an extremely valuable source of spontaneous information about their opinions about insurance providers. We are going to focus specifically on auto insurance reviews extracted from ConsumerAffairs, a website that collects reviews from several domains. The reviews we are going to use have been extracted from the top five companies in the Auto Insurance section: for each one of them we’ve picked ten items. You can download here the Excel spreadsheet we will be working on. It contains a single sheet where we have included two columns: one with the selected reviews, and another with the name of the company they refer to. As we have mentioned, for this tutorial we are going to use our Vertical Pack for Voice of the Customer analysis. Vertical Packs are a combination of preconfigured models or dictionaries, powerful APIs and specific add-ins for Excel that enable you to adapt text analytics to your domain with only one click. Just by registering at MeaningCloud, you have a 30-day trial for all Vertical Packs available. The trial starts the moment you first analyze a text, so users that have been using MeaningCloud for a while will also be able to try it out. To get started, you need to register at MeaningCloud (if you haven’t already), request access to the Voice of the Customer pack and download and install the VoC Excel add-in on your computer. Here you can read a detailed step by step guide to the process.